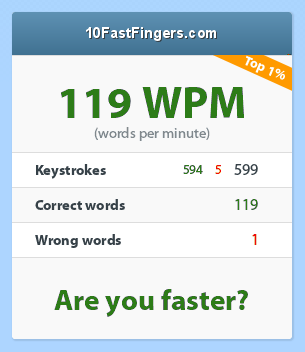 Re: how fast do you type? We've moved beyond that, Halfy. Now we need you to look in a mirror and tell us what you see. probably Nicole Kidman shaving his bits. Now I don't want to look in a mirror; what happens if I don't see Nicole?! Nicole, Nicole....I miss her so much already (especially if I ever figure out she was really there), though the gleam in her eye as she held a razor was always on the windy side of disconcerting. i think halfy just types slow and needs a reason to blame the test. The test is slow and you're trying to blame me! yes. for gods sake there are actually two lines .. so it should really not be a problem. unless u read over 2000 words pr. minute. I had to go back and reread this whole thread. I stand behind everything I said (or at least I look in the mirror and recognize myself still). This was a somewhat better test because you could read ahead, but since it was nonsense words you still couldn't fit a whole sentence in your head for speed purposes. BTW, I got almost the same score, but slightly faster. It's definitely a pretty artificial exercise, yeah. I tried in a couple different positions (since I don't have a desk in my room) and surprisingly I was fastest when lying on my back with the computer propped up against my knees. Anyway, this is what happens when I'm procrastinating things that are supposed to be hobbies. » Is anyone using fast recovery diodes in a VTA 70 or PAS?